A week of violence and protests in a town outside St. Louis is highlighting how poverty is growing most quickly on the outskirts of America’s cities, as suburbs have become home to a majority of the nation’s poor. In Ferguson, Missouri, a community of 21,000 where the poverty rate doubled since 2000, the dynamic has bred animosity over racial segregation and economic inequality. Protests over the police killing of an unarmed black teenager on Aug. 9 have drawn international attention to the St. Louis suburb’s growing underclass. Chronic job losses, foreclosures and evictions have made for harder times in Fresno, Calif., which has suffered economically for years. 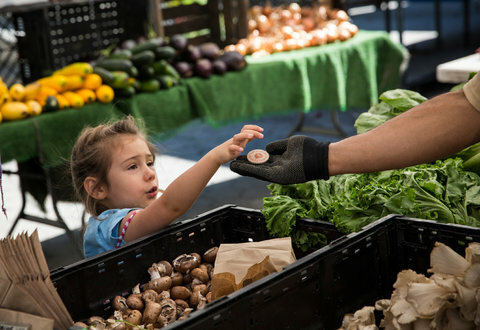 TIME meets Fresno residents in an emerging category of poverty: the new poor. 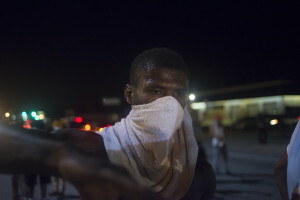 Check out this powerful and beautifully shot video by colleague and friend Scott Anger. Fifty years and $20 trillion later, LBJ’s goal to help the poor become self-supporting has failed. LBJ promised that the war on poverty would be an “investment” that would “return its cost manifold to the entire economy.” But the country has invested $20.7 trillion in 2011 dollars over the past 50 years. What does America have to show for its investment? Apparently, almost nothing: The official poverty rate persists with little improvement. That is in part because the government’s poverty figures are misleading. Census defines a family as poor based on income level but doesn’t count welfare benefits as a form of income. Thus, government means-tested spending can grow infinitely while the poverty rate remains stagnant. Do higher living standards for the poor mean that the war on poverty has succeeded? No. To judge the effort, consider LBJ’s original aim. He sought to give poor Americans “opportunity not doles,” planning to shrink welfare dependence not expand it. In his vision, the war on poverty would strengthen poor Americans’ capacity to support themselves, transforming “taxeaters” into “taxpayers.” It would attack not just the symptoms of poverty but, more important, remove the causes. By that standard, the war on poverty has been a catastrophe. The root “causes” of poverty have not shrunk but expanded as family structure disintegrated and labor-force participation among men dropped. A large segment of the population is now less capable of self-sufficiency than when the war on poverty began. The collapse of marriage in low-income communities has played a substantial role in the declining capacity for self-support. In 1963, 6% of American children were born out of wedlock. Today the number stands at 41%. As benefits swelled, welfare increasingly served as a substitute for a bread-winning husband in the home. According to the Heritage Foundation’s analysis, children raised in the growing number of single-parent homes are four times more likely to be living in poverty than children reared by married parents of the same education level. Children who grow up without a father in the home are also more likely to suffer from a broad array of social and behavioral problems. The consequences continue into adulthood: Children raised by single parents are three times more likely to end up in jail and 50% more likely to be poor as adults. A lack of parental work poses another major problem. Even in good economic times, a parent in the average poor family works just 800 hours a year, roughly 16 hours weekly, according to census data. Low levels of work mean lower earnings and higher levels of dependence. 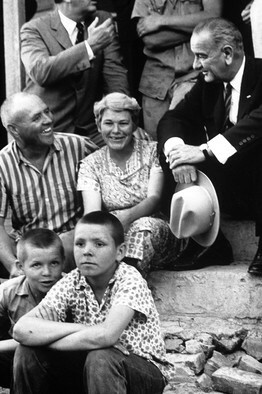 So how might we restore LBJ’s original mission in the war on poverty? First, as the economy improves, the government should require able-bodied, non-elderly adult recipients in federal welfare programs to work or prepare for work as a condition of receiving benefits. We should also reduce the antimarriage incentives rife within welfare programs. For instance, current programs sharply cut benefits if a mother marries a working father. Reducing these restrictions would begin a long-term effort to rebuild the family in low-income communities. Mr. Rector is a senior research fellow at the Heritage Foundation. To see the article in full, visit wsj.com. Take Victoria Houser, a 22-year-old single mother who lives in Painted Post, a small town in western New York. At first glance, her life doesn’t look all that bad. She lives in a cozy two-bedroom apartment. 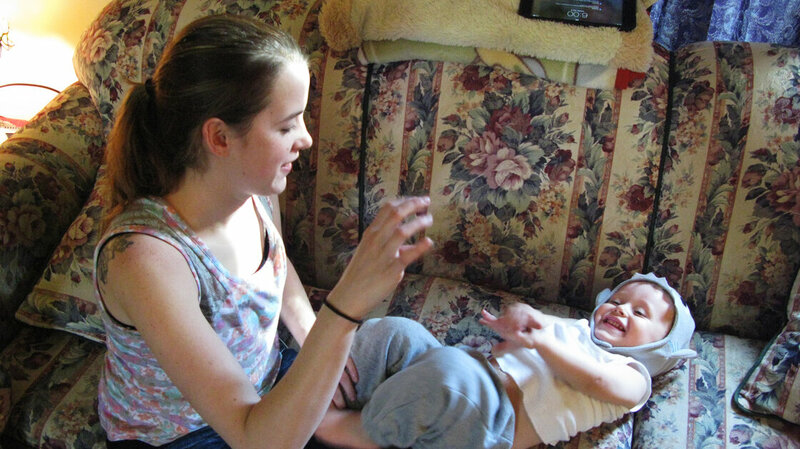 She has food, furniture and toys for her almost 2-year-old son, Brayden. He even likes playing a game called Fruit Ninja on her electronic tablet. Desiree Metcalf, here with one of her three daughters, is one of many poor Americans who find themselves trapped in a system meant to help. “He just likes touching it because he always sees me on my computer, my iPad or something,” Houser says. Brayden’s father is out of the picture, and Houser knows she could be a lot worse off. At least she has a job earning $10 an hour preparing food in a company cafeteria. Houser says she’s scared to let her son play outside. Her next-door neighbor was recently arrested for allegedly murdering someone and stuffing the body in a cupboard. Victoria Houser and her son, Brayden, may have food to eat and toys to play with, but she says she feels like she’s teetering on the edge. Read Paul Krugman’s op-ed on why it seems Republicans are out to get the poor. Obviously Mr. Kasich isn’t the first to make this observation. But the fact that it’s coming from a Republican in good standing (although maybe not anymore), indeed someone who used to be known as a conservative firebrand, is telling. Republican hostility toward the poor and unfortunate has now reached such a fever pitch that the party doesn’t really stand for anything else — and only willfully blind observers can fail to see that reality. Even as negotiations proceed in Congress over a new farm bill likely to contain a large cut in food stamps, needy Americans who rely on the program are confronting an immediate drop in benefits. As of today, the boost to the federal food stamps program included in the 2009 Economic Recovery Act expires, abruptly slashing benefit levels that were already inadequate for millions of poor children and their families, as well as impoverished disabled and elderly people, who will now find it significantly harder to afford adequate food. To read the full story, visit nytimes.com. What are your thoughts on cuts to the food stamp program? How will this help or hurt our country? California’s San Joaquin Valley is the country’s most productive farm belt: its fertile orchards and fields generate most of the nation’s fresh fruit and nuts. Yet for the people who work and live near these farms, access to healthy and fresh food can be a daily struggle. An outgrowth of the American Realities project, watch the three-part series I worked on this summer with Fresno-based KQED reporter Sasha Khokha and producer/cameraman Scott Anger. For the complete series, visit Center for Investigative Reporting online. You can also visit KQED.org. Joblessness is Killing Us. The Pope Says So. Brilliant Bill Moyers commentary. Melissa Boteach, director of Half in Ten, a campaign to cut poverty in half in ten years, notes “crisis levels of poverty” for children of color under age 5, including more than 42 percent of African-American children and 37 percent of Latino children living below the poverty line. The Children’s Defense Fund also highlighted disturbing statistics across the nation regarding poverty levels of children of color under age 6. Boteach points out that toxic stress associated with persistent poverty affects brain development in children, and leads to adverse outcomes in education, health and worker productivity when those children reach adulthood. We also know that modest investments in young children can offset some of those negative effects, but we currently are moving in the opposite direction. Boteach references a new report from First Focus — a bipartisan organization that advocates for investments in children and families — which finds that “in 2013 alone, sequestration will cut $4.2 billion of funding for children concentrated in the areas of education, early learning and housing, and Congress is considering a budget plan that would lock in or deepen these cuts for next year.” The report also finds that federal spending on children decreased last year by $28 billion, or 7 percent — the largest reduction since the early 1980s. Early education and childcare saw a particularly deep cut of 12 percent, and housing was cut by 6 percent. Several of the House Republicans who voted Thursday for a bill that slashed billions of dollars from the food stamp program personally received large farm subsidies for family farms. The bill cutting the food stamp program narrowly passed on a mostly party line 217 to 210 vote. Fincher himself has received his own large share of government money. From 1999 to 2012, Stephen & Lynn Fincher Farms received $3,483,824 in agriculture subsidies. Last year he took in $70,574 alone. For the third year in a row, the poverty rate has remained stuck at about 15 percent. Nearly one in six Americans was living in poverty in 2012, according to by the Census Bureau. Despite a slow-moving economic recovery, these latest numbers show that for poor Americans, there are few signs of any recovery. Fatima Goss Graves, who tracks poverty and employment stats at the National Women’s Law Center, called the poverty numbers a “disaster.” She’s seen the same dynamics facing the most vulnerable group in the American economy since the end of the recession. That group, according to the Census Bureau, includes more than 46 million people living at or below the poverty line, which the federal government defines as a family of four making $23,283 a year or less, not including government benefits like food stamps. To read more and listen to the story, go to NPR.org. Maybe Bill de Blasio got lucky. Maybe he only won because he cut a sweet ad featuring his biracial son. Or because his rivals were either spectacularly boring, spectacularly pathological, or running for Michael Bloomberg’s fourth term. But I don’t think so. The deeper you look, the stronger the evidence that de Blasio’s victory is an omen of what may become the defining story of America’s next political era: the challenge, to both parties, from the left. It’s a challenge Hillary Clinton should start worrying about now. WASHINGTON — House Republicans narrowly pushed through a bill on Thursday that slashes billions of dollars from the food stamp program, over the objections of Democrats and a veto threat from President Obama. The bill passed narrowly despite efforts by the House minority leader, Nancy Pelosi, who spoke at a news conference on Thursday. Related. The vote set up what promised to be a major clash with the Senate and dashed hopes for passage this year of a new five-year farm bill.The vote was 217 to 210, largely along party lines. To read more of Krugman’s op-ed, go to nytimes.com. In or around 1978, America’s character changed. For almost half a century, the United States had been a relatively egalitarian, secure, middle-class democracy, with structures in place that supported the aspirations of ordinary people. You might call it the period of the Roosevelt Republic. Wars, strikes, racial tensions and youth rebellion all roiled national life, but a basic deal among Americans still held, in belief if not always in fact: work hard, follow the rules, educate your children, and you will be rewarded, not just with a decent life and the prospect of a better one for your kids, but with recognition from society, a place at the table.